Here's a picture from my recent trip back home. Buses are a lot more common here than in the US and the quality is quite a bit higher. For this trip I was on the front seat of the top deck of an Intercape bus. It's a decent company save their unfortunate practice of incessant Christian propaganda during the ride. Hey Ryan, When I first rode Intercape and the Christian propaganda caught my attention--I was shocked! I remember thinking to myself, "Is this legal?" I hadn't realized how much I appreciated (and took for granted) the respect and freedom of religion offered in our country. 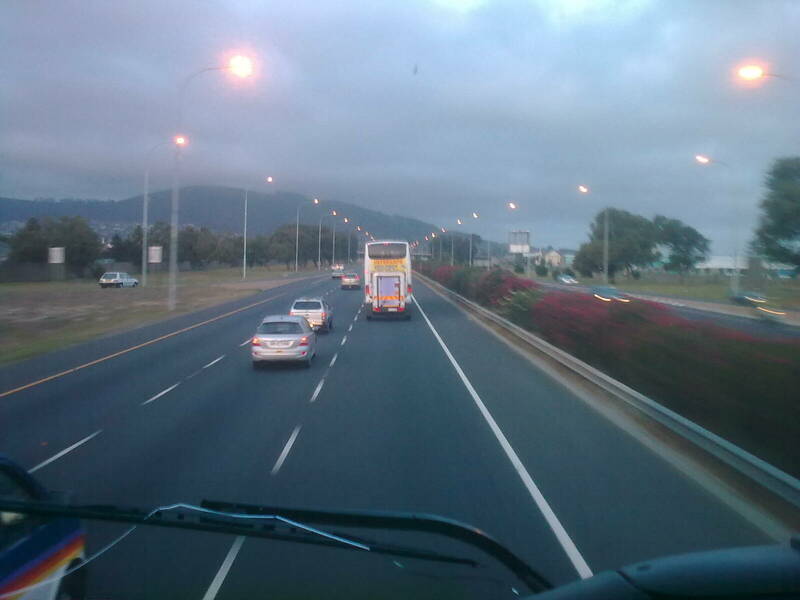 Other than that, I love riding Intercape! Quite a contrast to the taxis and worth every penny of the extra cost! Yeah, I agree. If I weren't so income-constrained I'd definitely always take the bus, and bugger the religious nonsense—that's why God made headphones!